Why do you need corporate graphics? What difference does the placement of a sign in your reception area make? The answers to these questions may not necessarily be as obvious as you think. For example, you know about the branding aspect of the signage. 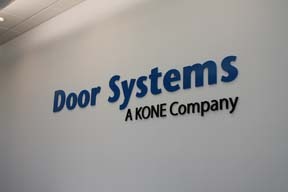 When you hang a unique sign in your office, it brands the business and helps customers or clients to associate your corporate name with a product or service. Yet did you know that the creation of a corporate identity is also tied to the sign that you place in your reception area, in your building’s foyer or really anywhere else that folks see it? Interior corporate graphics and signs for Chicago area businesses tell consumers a little bit about the company before they will ever do business with you. The sign’s makeup and placement informs the consumer about your outlook on corporate America, about your willingness to think outside the box and on your take on creativity and anticipation of business longevity. Who knew that there is so much rolled into the setup of just a plain sign that sits in your reception area, hangs on your conference room wall or takes up the hallway wall space in your office? Are you still somewhat unsure about what we mean? At Mark Your Space, we take signage to another level. Moreover, we help customers to think long-term when choosing a lobby sign or even just a window decal that separates two spaces. Look through our portfolio to see what we mean. Kone. This lobby sign is made up of four separate rectangles. Each of these has one letter attached to it. There is even spacing between the rectangles. When you look just below the sign, you notice that the reception area furniture fits in with the minimalist design of the marker. In short, this client has a clear idea about the corporate persona it wants consumers to associate with the business’ name. CE Law LLC. A law office seeks to inspire confidence in its clients and apprehension in opposing parties. This sign does both. The geometric pattern works beautifully with the patterning of the carpeting. It creates a welcoming whole. Yet the opposing counsel should not forget to also notice the imposing lettering on the left portion of the sign! Get on the wrong side of these attorneys, and your case is lost. Andresen Active Healthcare. Two banner stands hold attractive banners that feature similar design elements but display a different message each. This is done purposefully to showcase the full breadth of services the company provides to patients. At the same time, the visual aesthetics of the markers make them suitable for complementary displays at a trade show booth or within an office. Calibre Coffee. By using window graphics and posters to advertise their upcoming opening, the company succeeded at generating plenty of interest from passersby. Since the business also displayed its website address, consumers were able to check out their products before entering the store. For those who might not go online, the digital photos of baked goods highlighted some of the delectable offerings that would be for sale as soon as the business opened its doors. These corporate graphics not only support name recognition but also brand this coffee shop by highlighting its differences from other companies that are in the same niche. Title: Interior Corporate Graphics and Signs for Chicago!